We haven’t had one in a while, and I really wanted to share this furry face, so my apologies to whomever I may be hijacking this from! JJ in a tube. This inspired a funny email about the importance of proper pipe fitting and flow testing to my forensic engineering friend. I may make a post about that. 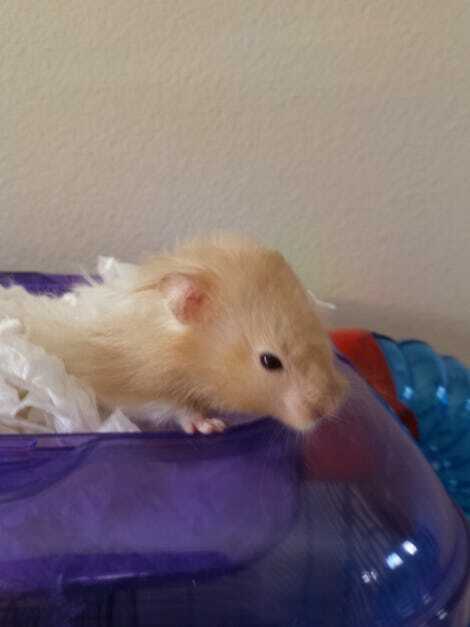 stepmom about the hamster, about how she’s leaving in November, and needed to find someone to care for him. Stepmom suggested me. JJ in one of his coconuts. to “help” with the setup. The 8 year old was more helpful than the 4 year old. was a little drunk and loved it. We are now referring to the whole cage setup as The Compound. JJ has escaped once, the first night, but was found soon after we discovered he was missing. He was setting up a nest in the back of the closet under the stairs, inspiring some Harry Potter jokes. through, with a loft/fort thing in the top of each, water and food in each one, numerous paper towel and toilet paper rolls (that he can barely fit through), three coconuts, two wheels, and one hanging thing with a bell. Share your furry faces everyone! Edited for length of post and number of photos.